His cousin made his debut for the Welsh side today. 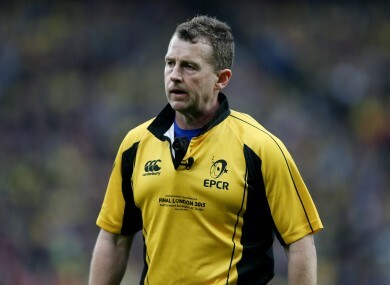 Well-known rugby referee Nigel Owens. A COUSIN OF Nigel Owens made a little bit of history this afternoon. Ioan Nicholas came off the bench in Llanelli Scarlets’ pre-season friendly away to Jersey. At 17 years and 134 days, the centre is the youngest player to represent the Scarlets since the game in Wales went regional. Owens is obviously quite proud of his little cousin’s potential achievement as he took to Twitter to wish him all the best. “Best of luck to my cousin Ioan Nicholas who may make his Scarlets debut today at just 17 years of age,” said Owens. Should Ioan Nicholas go on to become a regular for the Scarlets, playing in a game refereed by his cousin may represent a certain conflict on interest. That was flagged by one of Nigel Owens’ followers too, but the well-known referee said there’s no official protocol in place to deal with such a situation. @JohnnyRichards no protocol. You don't referee the team your a member of and your country. Nevertheless, it’s probably something rugby authorities would still prefer to avoid. Munster’s pre-season campaign started with a 29-38 defeat to Bernard Jackman’s Grenoble in front of a crowd of 4,178 at Thomond Park last night. In a game which featured 11 tries, Laurent Bouchet crossed to give the visitors an early advantage, but Munster stormed into a 19-7 lead thanks to three unanswered tries from Cathal Sheridan, Shane Buckley and Matt D’Arcy. James Percival pulled one back for Grenoble and the gap was five at half-time. After kicking two conversions, debutant Tyler Bleyendaal was withdrawn by Munster head coach Anthony Foley after half-an-hour as a precaution after the New Zealander picked up a groin injury. The game, which was split into four 20-minute quarters, resumed with Gio Aplon and Darren Sweetnam swapping tries early after the half-time restart, but a brace from Denis Coulson then left the French side 24-31 ahead. A 66th-minute try from Shane Buckley — his second of the game — left just two points between the teams but David Johnston was unable to add the extras to level the scores. Grenoble sealed the win with three minutes remaining when Arnaud Heguy got in for their sixth try of the evening. Email “Nigel Owens may no longer be refereeing games involving Llanelli Scarlets”. Feedback on “Nigel Owens may no longer be refereeing games involving Llanelli Scarlets”.